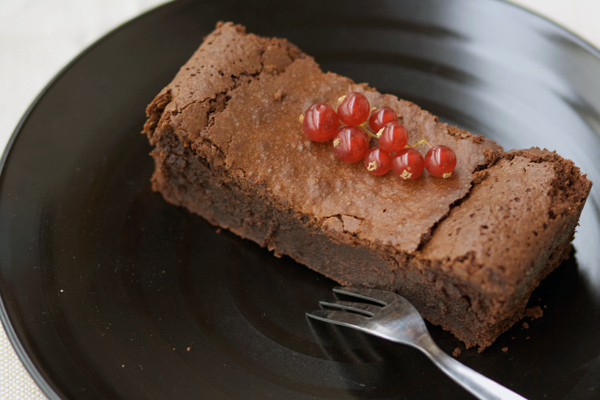 This cake without flour, gluten-free, and therefore suitable for people with Celiac disease, is very good, perhaps better than many other cakes made with flour. I got the recipe from the new book on chocolate created by Corriere in collaboration with Slow Food. I highly recommend it; it’s simple, fast to prepare, and everybody loves it! To begin, preheat the oven to 180° C.
In a large bowl, melt the butter together with the chocolate in the microwave, and allow it to cool. Slowly add the confectioner's sugar, then the eggs, one by one, mixing well. When the batter is uniform, line a plumcake mold with parchment paper, or grease it, and fill it by ⅔ with the batter, then put in the oven.